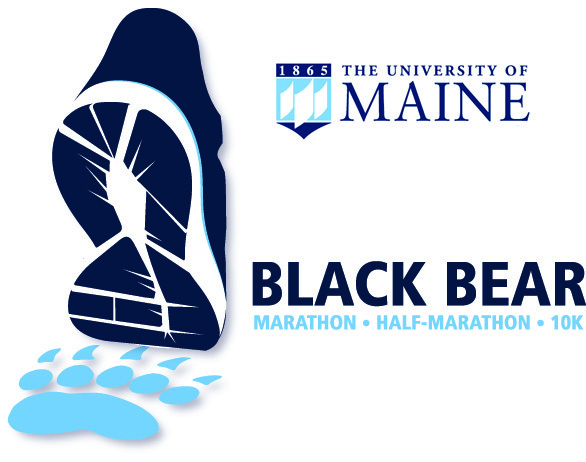 The University of Maine Alumni Association presents the Black Bear Marathon, Half Marathon and 10K. The race will take place on June 4, 2017 on the University of Maine Campus. The race starts at 7:30 AM and there is a 6 hour limit on the marathon course. Those who feel they will not finish the marathon in 6 hours can register for the early start at 6:30 AM (which will allow 7 hours). Early start is not available for the half marathon. Wheelchair entrants will start the race at 7:15 AM. The half marathon course will start on campus and travel through Orono and Old Town back to the bike path on campus. The full marathon course is a double loop of the half. The 10K race starts at 7:30 AM on the starting line of the Marathon and Half Marathon at the University Track. The first 500 registered runners receive a race shirt and the marathon and half marathon runners receive a finisher medal. More information about the race and courses is posted at www.umaine.edu/blackbearmarathon. No refunds, transfers, cancellations or deferrals are available for this race. No exceptions. Bib Transfers are available until 5/15/2017. If you would like to transfer from the half to full or full to half, please contact the race director. Refunds are not available for transfer from full to half or the 10K. The minimum age for participation, as recommended by the RRCA is 14 years old for the Half Marathon and the Full Marathon. Participants in the 10K must be over the age of 5 and have a parent or guardian responsible for them and sign their waiver. WAIVER & RELEASE OF LIABILITY, ASSUMPTION OF RISK & INDEMNITY AGREEMENT I, (sometimes hereinafter “Participant” )hereby acknowledge that I have voluntarily applied to participate in the Black Bear Marathon and Half Marathon Race (hereinafter the“Race”) on June 4, 2017, and hereby agree as follows: I, for myself, and on behalf of my spouse, children, parents, guardians, heirs and next of kin, and any legal and personal representatives, executors, administrators, successors and assigns, hereby make the following contractual representations pursuant to this Waiver and Release of Liability, Assumption of Risk and Indemnity Agreement: I. I hereby represent that (1) I am in good health and in proper physical condition to participate in the Race either as an individual or as a member of a team; (2) I agree that it is my sole responsibility to determine whether I am sufficiently healthy enough to participate in the Race; and (3) I declare that I am able to physically withstand and cope with the indicated rigors of the Race with or without a reasonable accommodation. If I need an accommodation, I will contact the organizers of the Race; at 207-581-1423. II. I UNDERSTAND AND ACKNOWLEDGE THE PHYSICAL AND MENTAL CHALLENGES ASSOCIATED WITH A THE RACE, AND REALIZE THAT RUNNING PORTIONS OF THIS EVENT ARE INHERENTLY DANGEROUS AND REPRESENT AN EXTREME TEST OF PHYSICAL AND MENTAL LIMITS. I UNDERSTAND THAT PARTICIPATION INVOLVES RISKS AND DANGERS WHICH INCLUDE, WITHOUT LIMITATION: THE POTENTIAL FOR SERIOUS BODILY INJURY, PERMANENT DISABILITY, PARALYSIS AND DEATH; LOSS OR DAMAGE TO PROPERTY; EXPOSURE TO EXTREME CONDITIONS AND CIRCUMSTANCES; ACCIDENTS, ILLNESS, CONTACT OR COLLISION WITH OTHER PARTICIPANTS, SPECTATORS, VEHICLES OR OTHER NATURAL OR MANMADE OBJECTS; DANGERS ARISING FROM ADVERSE WEATHER CONDITIONS; IMPERFECT COURSE CONDITIONS; WATER, ROAD AND SURFACE HAZARDS; EQUIPMENT FAILURE; INADEQUATE SAFETY MEASURES; PARTICIPANTS OF VARYING SKILL LEVELS; SITUATIONS BEYOND THE IMMEDIATE CONTROL OF THE RACE ORGANIZERS; OTHER UNDEFINED HARM OR DAMAGE WHICH MAY NOT BE READILY FORSEEABLE; OTHER PRESENTLY UNKNOWN RISKS AND DANGERS (HEREINAFTER “RISKS”). I UNDERSTAND THAT THESE RISKS MAY BE CAUSED IN WHOLE OR IN PART BY MY OWN ACTIONS OR INACTIONS, THE ACTIONS OR INACTIONS OF OTHERS PARTICIPATING IN THE RACE, OR THE ACTS, INACTION OR NEGLIGENCE OF THE RELEASED PARTIES DEFINED BELOW, AND I HEREBY EXPRESSLY ASSUME ALL SUCH RISKS AND RESPONSIBILITY FOR ANY DAMAGES LIABILITIES, LOSSES OR EXPENSES WHICH I INCUR AS A RESULT OF MY PARTICIPATION IN THE RACE. I AM AWARE THAT THESE ACTIVITIES ARE HAZARDOUS ACTIVITIES AND THAT I COULD BE SERIOUSLY INJURED OR EVEN KILLED. I AM VOLUNTARILY PARTICIPATING IN THESE ACTIVITIES WITH KNOWLEDGE OF THE DANGER INVOLVED, AND AGREE TO ASSUME ANY AND ALL POSSIBILITY OF BODILY INJURY, DEATH OR PROPERTY DAMAGE, DUE TO THE RISKS WHETHER KNOWN OR UNKNOWN. III. I accept sole responsibility for my own conduct and actions while participating in the Race, and the condition and adequacy of my equipment, such as clothing and sneakers, watches, etc.. and further acknowledge that these items will get used and may, at the end of the event, be in such a state as not to be used again and hold harmless and release the Released Parties for any items needing repair or replacement. IV. I hereby authorize any licensed physician, emergency medical technician, hospital or other medical or health care facility (hereinafter “Medical Provider”) to treat me for the purpose of attempting to treat or relieve any injuries received by me arising out of or relating to the Race. I authorize such Medical Provider to perform all procedures deemed advisable by the Medical Provider in attempt to treat or relieve any such injuries and any related conditions that may be encountered during the course of attempting to treat or relieve such injuries I may suffer. I realize that there is a possibility of complication of anesthesia as deemed advisable during the treatment, and I assume any such risk for and on behalf of myself. I acknowledge that no warranty is being made as to the results of any medical treatment. I acknowledge that I will be responsible for the payment of all fees, charges and other monetary items related to such treatment and/or care. I acknowledge that the organizers of the Race and other Released Parties are not responsible for my medical needs or any medical treatments of any kind. V. I grant to the released parties, the right, permission, and authority to use my name, voice, picture, video, or photograph, in any broadcast, telecast, commercial advertisement, promotion, website, results release, social media, or other account from the Race. I further grant the released parties the right to photograph and/or record me and further to use my face, likeness, voice and appearance in connection with exhibitions, publicity, advertising and promotional materials without reservation or limitation and I WAIVE any rights to future compensation to which I might otherwise have been entitled for such use. I acknowledge and agree that there are no refunds, transfers or deferrals for this race and that all sales are final and hold the race director, the University of Maine, and all staff and volunteers harmless for cancellation due to weather, safety, or other purposes decided by the race officials, race director, police, or committee. VI. I ACKNOWLEDGE THAT BY AGREEING TO THIS DOCUMENT, I HEREBY RELEASE, WAIVE AND CONVENANT NOT TO SUE AND FURTHER AGREE TO INDEMNIFY, DEFEND AND HOLD HARMLESS THE FOLLOWING PARTIES: THE ORGANIZERS OF THE RACE; LAURI SIDELKO, THAD DWYER, ALL RACE COMMITTEE MEMBERS, THE UNIVERSITY OF MAINE SYSTEM, THE UNIVERSITY MAINE; RACEWIRE, SUB5 TRACK CLUB; AND THE TOWN OF ORONO; THE TOWN OF OLD TOWN, ALL SPONSORS, ADVERTISERS, EMPLOYEES, CONTRACTORS, AND VOLUNTEERS HIRED OR USED BY ANY OF THE FOREGOING PARTIES; ALL LAW ENFORCEMENT AGENCIES AND OTHER PUBLIC ENTITIES PROVIDING SUPPORT FOR THE RACE; AND EACH OF THE FOREGOING PARTIES’ RESPECTIVE PARENTS, SUBSIDIARIES AND AFFILIATES , TRUSTEES, OFFICERS, DIRECTORS, PARTNERS, SHAREHOLDERS, MEMBERS, INSURERS, SUCCESSORS, ASSIGNS, AGENTS, EMPLOYEES, CONTRACTORS AND VOLUNTEERS (ALL HEREINAFTER “RELEASED PARTIES”) WITH RESPECT TO ANY LIABILITY, CLAIM(S), DEMAND(S), CAUSE(S) OF ACTIONS, DAMAGE(S), LOSS OR EXPENSE (INCLUDING COURT COSTS AND REASONABLE ATTORNEYS FEES) OF ANY KIND OR NATURE WHICH MAY ARISE OUT OF, RESULT FROM OR RELATE TO MY PARTICIPATION IN THE RACE, SPECIFICALLY INCLUDING CLAIMS FOR LIABILITY CAUSED IN WHOLE OR IN PART BY THE NEGLIGENCE OF THE RELEASED PARTIES. I AGREE THAT IF, DESPITE THIS AGREEMENT, I, OR ANYONE ON MY BEHALF MAKES A CLAIM FOR LIABILITY AGAINST ANY OF THE RELEASED PARTIES, I WILL INDEMNIFY, DEFEND AND HOLD HARMLESS EACH OF THE RELEASED PARTIES FROM ANY SUCH LIABILITY WHICH MAY BE INCURRED AS A RESULT OF ANY SUCH CLAIM. THIS AGREEMENT EXTENDS TO ALL ACTS OF NEGLIGENCE BY THE RELEASED PARTIES AND IS INTENDED TO BE AS BROAD AND INCLUSIVE AS IS PERMITTED BY THE LAWS OF THE STATE OF MAINE. THIS AGREEMENT IS INTENDED TO BE A COMPLETE AND UNCONDITIONAL RELEASE OF ALL LIABILITY OF THE RELEASED PARTIES TO THE GREATEST EXTENT ALLOWED BY LAW. VII. I hereby warrant that I have read this agreement carefully or have had it read to me; understand its terms and conditions; acknowledge that I am at least 14 years of age for the half and full marathon and have a legal parent or guardian who is over 18 agreeing to all terms on my behalf. Participants under 14 years of age are NOT allowed to participate in the half or full marathon. For the 10K race, participants over the age of 5 may participate with the consent and supervision of a legal parent or guardian over the age of 18. I understand I will be giving up substantial legal rights by signing it; acknowledge that I have signed this agreement freely and voluntarily, without any inducement, assurance or guarantee; and intend for my signature to serve as confirmation of my complete and unconditional acceptance of the terms, conditions and provisions of this agreement. This agreement represents the complete understanding between the parties regarding these issues and no oral representations, statements or inducements have been made apart from this agreement. If any provision of this agreement is held to be unlawful, void or for any reason unenforceable, then that provision shall be deemed severable from this agreement and shall not affect the validity and enforceability of any of the remaining provisions hereof. This agreement shall be construed and interpreted pursuant to the laws of the State of Maine. If signed by Parent or Guardian: Parent or Legal Guardian verifies that the dangers of the activities and the significance of this Waiver and Release of Liability, Assumption of Risk and Indemnity Agreement were explained to the Participant and that the Participant understood them. I, the Parent or Legal Guardian of the Participant, agree, in consideration of my child being permitted to participate in the Race, to be bound by the terms of this Agreement and hereby indemnify, hold harmless, covenant not to sue and release the Released Parties in the same manner and with the same force and effect as set forth in sections III and VI above with regard to my child participating in the Race. I grant to the Released Parties, the right, permission, and authority to use my child’s name, voice, picture, or photograph, in any broadcast, telecast, commercial advertisement, promotion, or other account from the Race. I further grant the Released Parties the right to photograph and/or videotape my child and further to use my child’s face, likeness, voice and appearance in connection with exhibitions, web, publicity, advertising and promotional materials without reservation or limitation and I WAIVE any rights to future compensation to which I might otherwise have been entitled for such use. Assented and agreed to on this day in 2016-2017.